People can’t get enough of sashimi at the moment. The protein-rich delicacy originally from Japan is everywhere. And whether its smothered in wasabi paste or drizzled in soy sauce, tuna is one of the most prevalent varieties of the dish. Eating so much of it though, on lunch breaks in New York and London, and questions of sustainability, freshness, and authenticity arrive. That’s why a Kickstarter project called Two Fish is trying revolutionise the sashimi trade. Its prevailing belief is to “save the world by eating fish”. Two Fish is a team of chefs specialising in seafood and distribution that is “reinventing” the way US customers source and eat it — buying fish directly from boats, allowing sushi experts to slice it right away, and delivering it straight to peoples’ doors. “You get the freshest fish direct from the boat,” says the team, “it’s sliced and ready”. The San Francisco organisation explains that it sources Yellowfin tuna — a sustainable choice according to Seafood Watch — caught by hook or line, lands it to be sliced, and then vacuum seals and blast freezes it to be shipped. It’s all very ethical. Usually about 20-50% of sushi fish is discarded, but instead the team is donating these pieces to a partner called Project Open Hand, which provides meals to senior citizens and ill people. By buying direct from fishermen, lots of money is also saved, says Two Fish. There’s a goal of $US15,000 and on Friday, Nov. 14, it tipped over the mark by a few hundred dollars, with just one day to go. 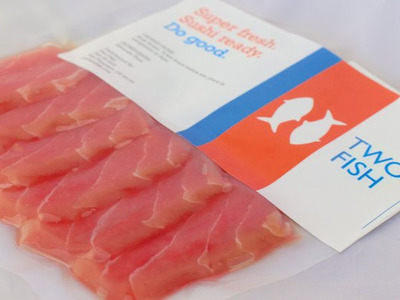 So it looks like affordable, sustainable sashimi that truly supports the fishing sector is arriving to the US. Maybe the UK will follow suit.